Call for beta testers! The Setmore-Square integration has moved from alpha to beta, and we need a crew of intrepid Setmore users to help us test it out. Also – you can now let customers book appointments from Instagram, and automatically push payment data from Setmore to Xero. Continue reading for more info! Post a comment below to request beta access to the Setmore-Square integration. We’ll add candidates to the beta list and reach out personally with additional instructions. Note that the beta includes taking payments both from the Setmore platform via browser on any laptop or desktop, AND taking payments from the Setmore mobile app on your iPhone or Android device. We need testers on both our browser and mobile platforms. It’s a beta test, but rest assured your payments will be safe and secure. Square handles the payment side of things, we’re primarily just testing specific interface enhancements that will make it possible to take payments in Setmore. *Note: Square equipment and transaction fees still apply. Square beta testers must be in the US, Canada, UK, and Australia. You can now add a “Book” button to your Instagram business profile! 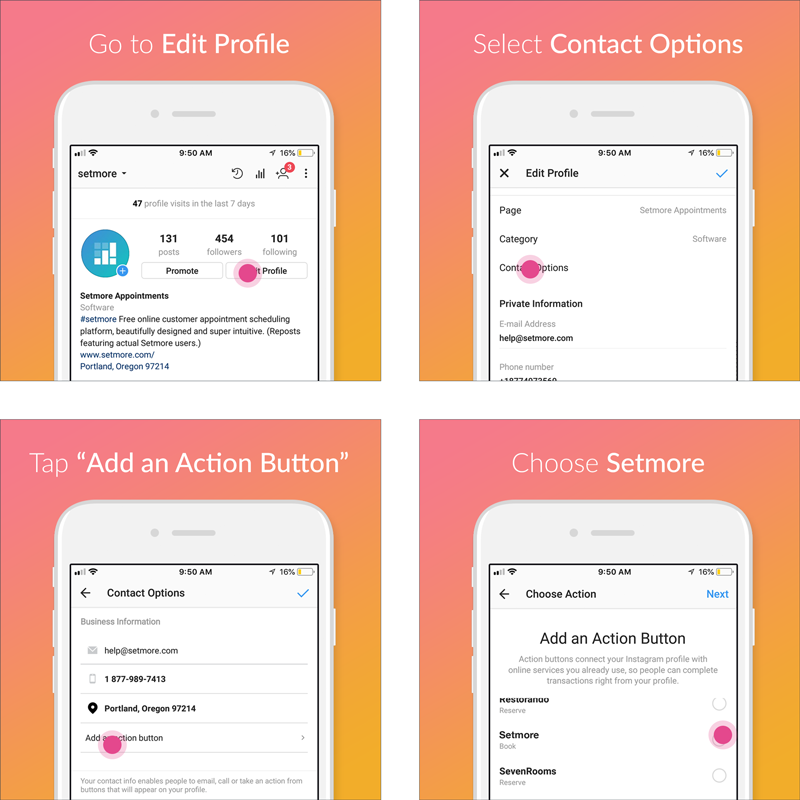 This will give your customers and followers the ability to book appointments to your Setmore calendar through Instagram, without having to exit Instagram or tab into another app. Please note, this integration only works for Instagram business profiles, and not personal profiles. Bottom line, this integration will probably lead to more appointments. As people get excited looking at your latest fade, cut, color, tattoo, or whatever it is, you can turn that excitement into action by giving customers the opportunity to book an appointment right then and there. Adding the Book button to your Instagram profile is super simple, super easy, and it’ll only take a few minutes. Read our support article for step-by-step instructions, and contact our support team if you have any questions! 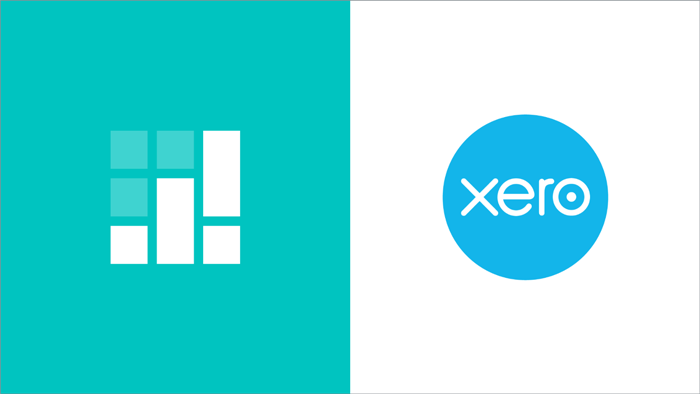 Xero is beautifully designed accounting software for small businesses, and now you can integrate it with your Setmore calendar to help automate your accounting practices! 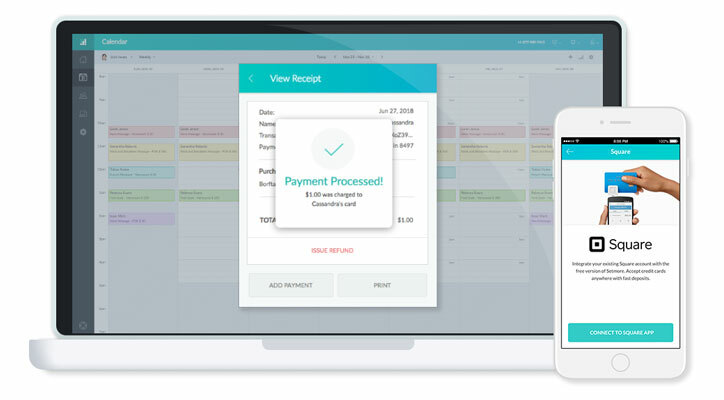 With this integration, Setmore will automatically push any payment data you’ve logged into your Setmore calendar to your Xero account, saving you the time and hassle of having to manually log these transactions. This integration works great when paired with one of our payment integrations, such as with Stripe Payments (requires Setmore Premium), or Square (in beta testing – usable with the free version of Setmore). Fixed a bug that prevented some users from adding new services to their account. Fixed a bug that prevented some service categories with the name “Other Services” from appearing on the calendar when booking an appointment. Fixed a bug that prevented some staff logins using Gmail social sign-in from logging into Setmore. When updating business hours from the mobile app, Setmore will no longer accidentally reset the “Scheduling Window” parameter. Customer names will now appear in the salutation of class appointment email reminders. Fixed an issue that caused some instances of Setmore to freeze during the initial setup of a new account. Fixed an issue that caused some instances of Setmore to not update the calendar availability for staff profiles with updated working hours. Can i try setmore-square payment!? I’d love to test it out. I would be happy to help test! I’d love to beta test the Setmore/Square! Sign me up for square beta! We would love to Square beta test! We love using Square & setmore and would love to have it together! Sign me up for the square beta . Beta for Square sounds AWESOME! Been waiting to try it! May we please? I would love to Test The Beta, My Clients are all much more familiar with Square than Strip. Loving the new integration. Would love to try the beta of SquareUp integration! Please! I would like to be on the beta list! Hi- I would like to test Square. I use it for 99.9% of all my transactions for my business. I’m down. I appreciate the app, so happy to help. Sign me up for beta testing for square. I would love to beta test the square integration. This would be great for my business. Everyone above this comment has been added to our beta list for the Setmore-Square integration! Thanks everyone – our developers will reach out via email when they’re ready to invite beta users. We would like to test the integration! I would love to test out the Setmore Square payment system! I’d love to test the square integration! Interested in being a beta tester a I already use square ! We are interested in the square beta testing. Yes I’d like to be part of the Beta test program gor Square- Setmore integration. I would love to partake in the testing phase for my business! I would love to try it out !! Awesome, we would love to rest it! Everyone above this comment has been added to our beta list – thank you!! Hi I am currently using the free version of your app and have really be enjoying it compared to the previous app “SimplyBookMe.” It also makes the 200+ bookings a month much easy to read and track. I was considering upgrading to the paid version. I would like to participate in the beta-test. Please consider me! Thank you. Sante Hair Salon would love to be apart of the beta access to the Setmore-Square integration. I’d love to be part of the Square & Setmore beta testing! I’d like to be a square Setmore beta tester. I would like to t beta test square integration please. I would love to test! I would love to try this as my clients have been asking for it! I would like to sign up to beta test this please! I’m interested in trying out the Setmore-Square integration! I’d aboluetlg LOVE to be your beta-tester! I always have to bounce back and forth between my Setmore and Square apps at the end of each client appointment, And it would be amazing to have it all in one app! Hi, Ive been using SetMore for just about one year and I completely love it. Sign me up for Beta Testing! Image Hair Salon would like to try the square beta testing. Thank you for showing up when I searched for an appointment service back in 2014. You have grown so much and I would LOVE to be part of your square beta team. I’ve been a beta for a lot of big social media brands and services, so I am happy to help you continue your growth, Setmore! I would like to beta test Setmore payment. Would love to beta test the Setmore square integration. Happy to be a tester! Hi we are interested to try the square setmore beta. Love to try it since I already use square! I’m interested in trying out this beta. I use Setmore and Square Pay for my freelance photography work. It’ll be great to integrate both of them, so I can schedule my appointments and be able to send a digital invoice to my clients. And not have to re enter the clients info. Would love to beta-test Setmore! I would love to test the beta Square integration of Setmore please! David, you’re on the list. Yup! Definitely keen to test it out! We are just about to integrate Square across all our platforms. Hey! I’d love to test out the Setmore-square!! We are looking to set up square throughout our warehouse, and want to try it first! I would love to test the square! I imm interested to try this smart tool! I’ll be a beta tester if you need one. I’ve been using square for nearly a year now. Everyone above this comment is added to the beta list. Thank you! I would love to be a BETA tester for the square/setmore integration. I’d like to beta test the new square integration. I’d like to get this moving forward, I’ll test! We will most def beta test square we use it in the road for our photographers so would love to test. I’m interested in trying this out! I would love to volunteer to be a beta test for you guys! I’d like to try it out. Would love to be part of the testers. Sign me up for Square Beta please! I would love to be a Beta tester! I use square everyday as well as Setmore for all my appointments! Count me in! Yes, please include me in the Square Beta Testing. I’d love to try the beta square Setmore! I’d love to test please! Hello, I would love to test Setmore with Square! Please let me know what I need to do or how to link the accounts. Many thanks!! I would love to try out the Square integration! It like to try the beta version. I’d love to be a beta tester for square integration! I would like to participate in Square beta testing . I would love to be a beta tester. I’m currently one for Apple also, providing feedback???? Hi I would like to test a beta version please. Please le the know how to proceed. I use square and setmore. I’d love to try it out. Cheers! I would love to test it out! I would love to try the square integration please! If still need beta testers for square I’m on board! We’d love to try it out! We use square currently and setmore. Would love integration! love the idea of setmore to square payments, want to sign up for this. I would love to beta test the Square integration! I’d love to beta test Square for Setmore. I would love to be added to the beta test list! Love to try integrated card payments. I’d be happy to test out the S-S integration. Everyone above this comment has been added to the list. Thank you all! I was only expecting about 30 signups, we’ve got well over 150 and I’m totally blown away. I’m closing comments for now. Our developers will reach out to candidates via email when we’re ready to send out beta invites. Thanks again!